The terms ion implantation and diffusion are related to semiconductors. These are two processes involved in the production of semiconductors. 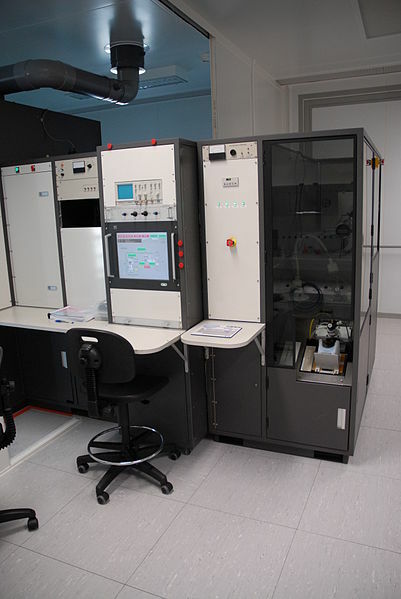 Ion implantation is a fundamental process used to make microchips. It is a low-temperature process that includes the acceleration of ions of a particular element towards a target, altering the chemical and physical properties of the target. Diffusion can be defined as the motion of impurities inside a substance. 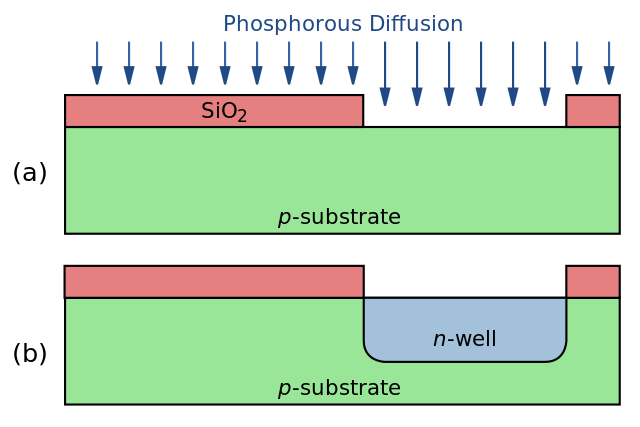 It is the main technique used to introduce impurities into semiconductors. The main difference between ion implantation and diffusion is that ion implantation is isotropic and very directional whereas diffusion is isotropic and involves lateral diffusion. Ion implantation is a low-temperature process used to change the chemical and physical properties of a material. This process involves the acceleration of ions of a particular element towards a target to alter the chemical and physical properties of the target. This technique is mainly used in semiconductor device fabrications. Accelerated ions can alter the composition of the target (if these ions stop and remain in the target). The physical and chemical changes of the target are a result of striking the ions at a high energy. Ion implantation equipment should contain an ion source. This ion source produces ions of the desired element. An accelerator is used to accelerate the ions to a high energy by electrostatic means. These ions strike the target, which is the material to be implanted. Each ion is either an atom or a molecule. The amount of ions implanted on the target is known as the dose. However, since the current supplied for the implantation is small, the dose that can be implanted at a given time period is also small. Therefore this technique is used where smaller chemical changes are required. One major application of ion implantation is the doping of semiconductors. Doping is the concept where impurities are introduced to a semiconductor in order to alter the electrical properties of the semiconductor. The advantages of ion implantation include precise control of dose and depth of the profile/ implantation. It is a low-temperature process, so there is no need for heat-resistant equipment. Other advantages include a wide selection of masking materials (from which ions are produced) and excellent lateral dose uniformity. Diffusion can be defined as the motion of impurities inside a substance. Here, the substance is what we call a semiconductor. This technique is based on the concentration gradient of a moving substance. Hence it is unintentional. But sometimes, diffusion is intentionally carried out. This is carried out in a system called diffusion furnace. Dopant is a substance used to produce a desired electrical characteristic in a semiconductor. There are three main forms of dopants: gases, liquids, solids. However, gaseous dopants are widely used in the diffusion technique. Some examples of gas sources are AsH3, PH3, and B2H6. There are two main steps of diffusion as follows. These steps are used to create doped regions. In this step, desired dopant atoms are controllably introduced on to the target from methods such as gas phase diffusions, and solid phase diffusions. In this step, the introduced dopants are driven deeper into the substance without introducing further dopant atoms. Ion Implantation: Ion implantation is a low-temperature process used to change the chemical and physical properties of a material. Diffusion: Diffusion can be defined as the motion of impurities inside a substance. Ion Implantation: Ion implantation is isotropic and very directional. Diffusion: Diffusion is isotropic and mainly includes lateral diffusion. Ion Implantation: Ion implantation is done at low temperatures. Diffusion: Diffusion is done at high temperatures. Ion Implantation: The amount of dopant can be controlled in ion implantations. Diffusion: The amount of dopant cannot be controlled in diffusion. Ion implantation: Ion implantation may sometimes damage the surface of the target. Diffusion: Diffusion does not damage the surface of the target. Ion Implantation: Ion implantation is more expensive because it require more specific equipment. Diffusion: Diffusion is less expensive compared to ion implantation. Ion implantation and diffusion are two techniques used in the production of semiconductors with some other materials. The main difference between ion implantation and diffusion is that ion implantation is isotropic and very directional whereas diffusion is isotropic and there is lateral diffusion. 1. “Ion implantation.” Wikipedia, Wikimedia Foundation, 11 Jan. 2018, Available here. 2. 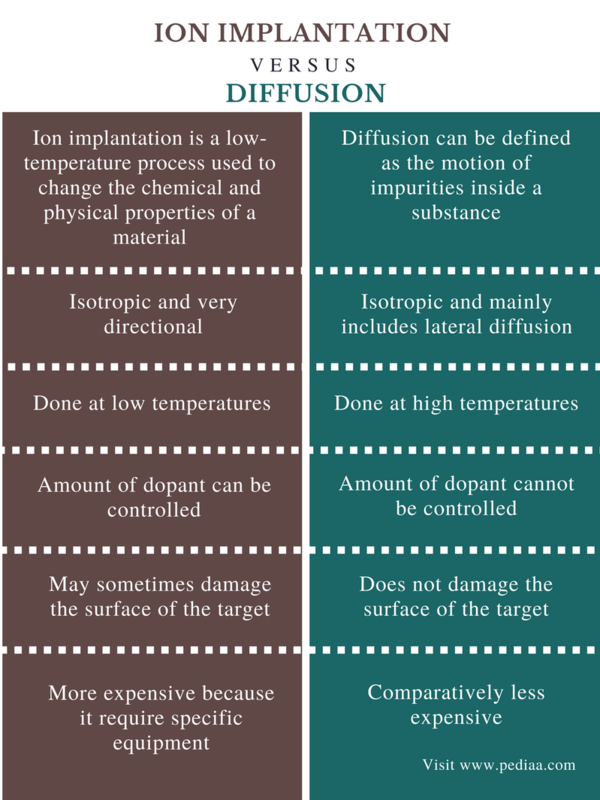 Ion Implantation Versus Thermal Diffusion. JHAT, Available here.